Peterborough Panthers rider Bradley Wilson-Dean suffered hand damage and concussion during the club’s East Anglian derby triumph last week. The Kiwi ace was involved in a heat 14 pile up in the 49-41 SGB Championship success at Ipswich on Thursday (August 23). Initial fears Wilson-Dean had sustained broken fingers were allayed following x-rays at hospital, but ligament damage was identified. He has automatically been sidelined for nine days due to the concussion which means he misses a couple of fixtures for SGB Premiership side Somerset this week, but he will be back on a bike by the time table-topping Panthers return to action against Berwick on September 9. 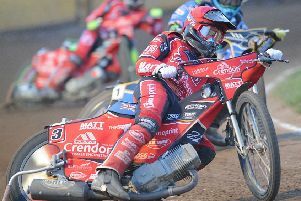 Danish star Michael Palm Toft missed the success in Suffolk after suffering twisted knee ligament in a spill the previous night while riding for King’s Lynn in the SGB Premiership. Palm Toft also hurt an ankle in a crash during Panthers’ defeat at Berwick on August 18, but neither problem is expected to keep him out for long. In fact he is expected to ride for Lynn at Leicester in a top-flight TV clash tonight (Bank Holiday Monday). Team boss Carl Johnson said: “Bradley was involved in a big crash and was completely blameless even though the referee chose to exclude him. “There’s nothing you can do when another rider’s foot-rest goes through your front wheel. That is never going to end well so it’s a relief that nothing is broken for Bradley. “He was feeling pretty sore for a couple of days, but he’s got this week to get himself right. “It’s nothing too serious with ‘Tofty’ either. He has had a couple of crashes lately and has been riding through the pain barrier so we didn’t want him to aggravate any injuries. Palm Toft is now within touching distance of taking the Panthers’ number one berth from Scott Nicholls. Seven-time British champion Nicholls, who has been in terrific form in recent days, boasts an 8.19 average with Palm Toft having risen to 8.12. Nicholls’ figure has predictably dropped from a high starting mark of 9.72 whereas Palm Toft has made impressive progress this term after beginning the campaign on a 6.77 average. Captain Simon Lambert has dropped to the bottom of the Panthers averages after being leapfrogged by in-form Tom Bacon. That means Emil Grondal, whose own mark has also tumbled, goes back up into the main body of the team in place of Lambert.